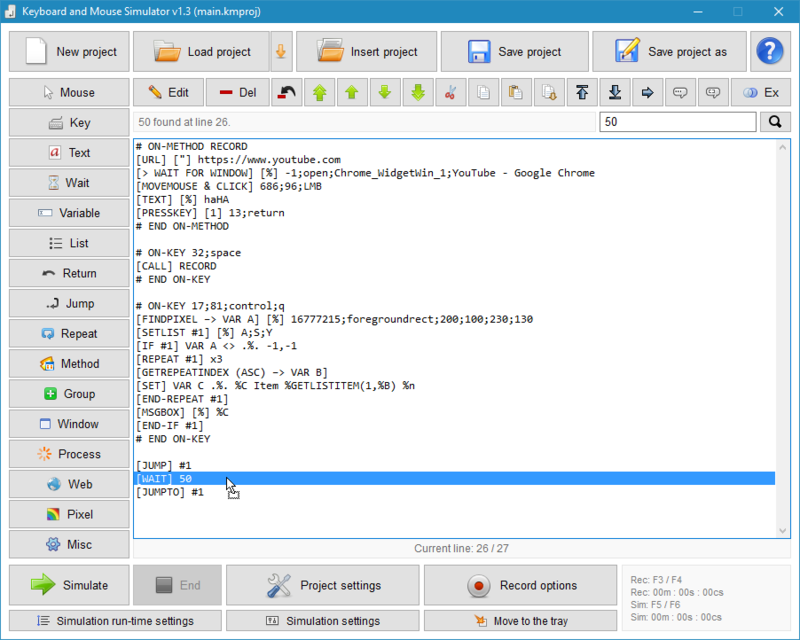 Create a list of commands and combine them with logical elements to simulate any mouse click, key press or any other set of actions that can be done by a real user. 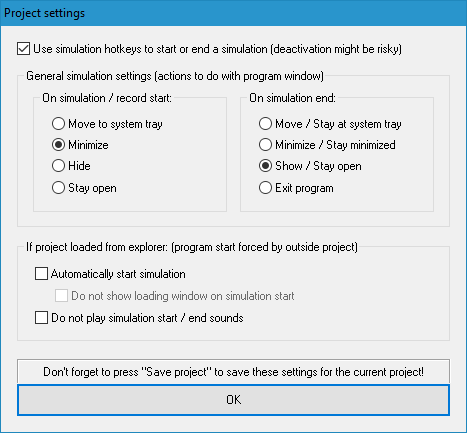 The basic idea is that you build your simulation by filling the list with different commands and logical elements, so it will later be simulated from the top to the bottom, line by line. 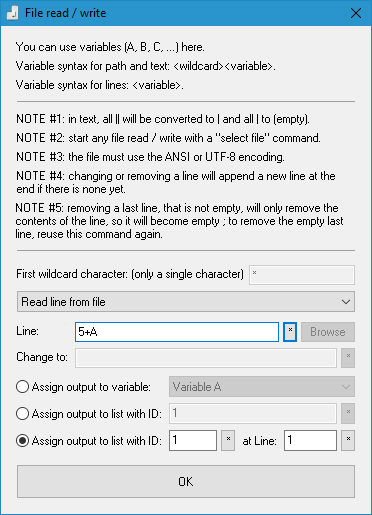 1) Add all commands manually. To do so, browse through the left command panel and add the ones you want. You can also add different logical elements, such as variables, methods, jump marks, repeat marks and many more. 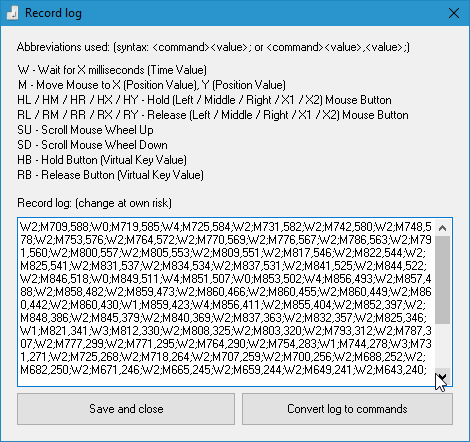 2) Record sequential key presses and mouse movements and write them automatically to a record log. The record mode can be activated and deactivated by user-defined hotkeys, which you can see in your bottom-right of the main window. Use global hotkeys to start (def. F5) and stop (def. F6) a simulation. If the hotkeys aren't working in some overlay applications, restart the project as administrator. The hotkeys can be changed in the simulation settings. 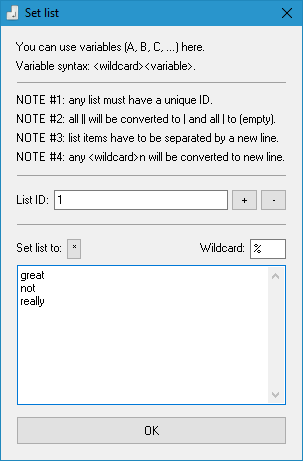 To store and pass information, the program uses variables and lists. These can be recalled from everywhere else. 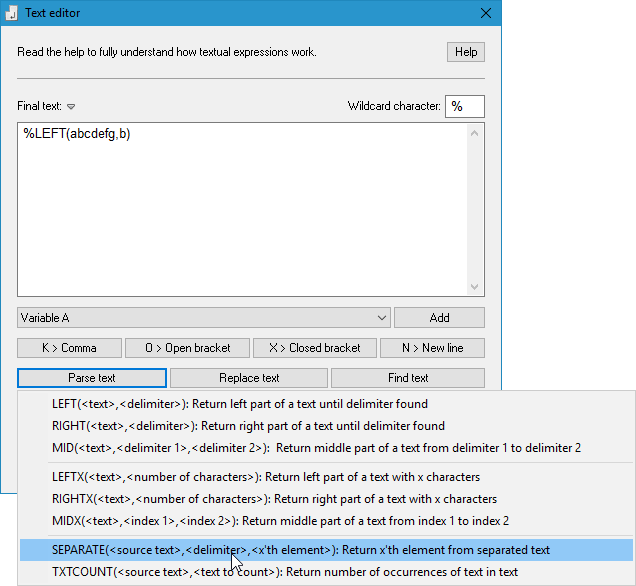 Variables can be either of text or number type. 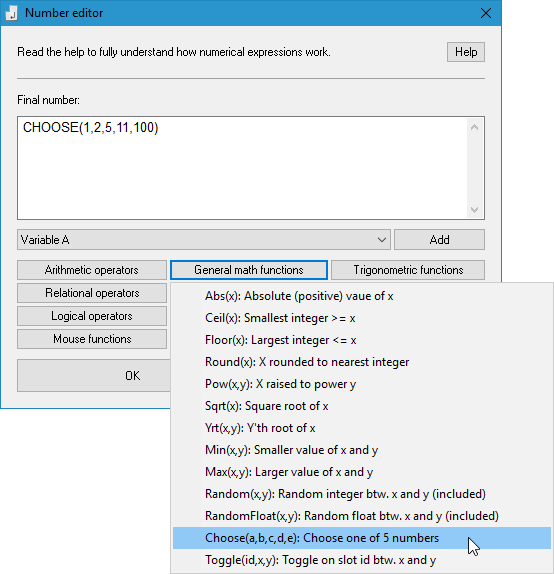 More advanced users may try out the number editor that evaluates numerical expressions. Thus, more complex and difficult algorithms can be created. Lists are an other type of information storage. They are always identified with an ID number, and can hold multiple lines of information. 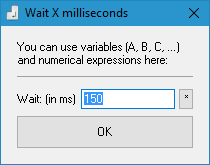 Example of the "Wait X milliseconds" window. 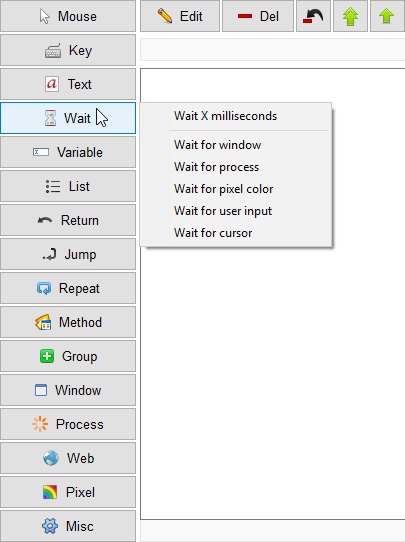 Also available: "Wait for window", "Wait for process", "Wait for pixel color", "Wait for user input", "Wait for cursor". Example of the "Click mouse button" window. 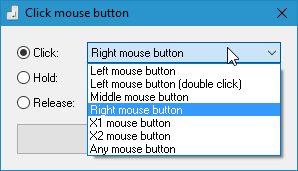 Also available: "Move mouse to XY and click", "Scroll mouse wheel", "Is mouse clicked? ", "Is mouse in region?". 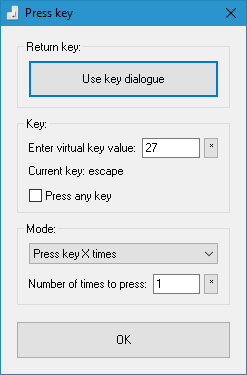 Example of the "Press key" window. Also available: "Press 2-key combination", "Press 3-key combination", "Is key pressed? ", "Get last user input". 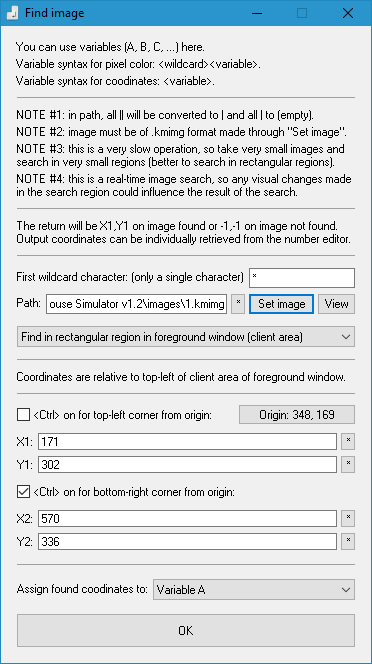 Example of the "Find image" window. Also available: "Find pixel color", "Get pixel color", "Wait for pixel color". If you have any further questions, read the help, or ask in the comments below. Do not change, rename or delete any files from the program's folder. You can move the whole folder to an other place, but do not detach the files from the executable file. 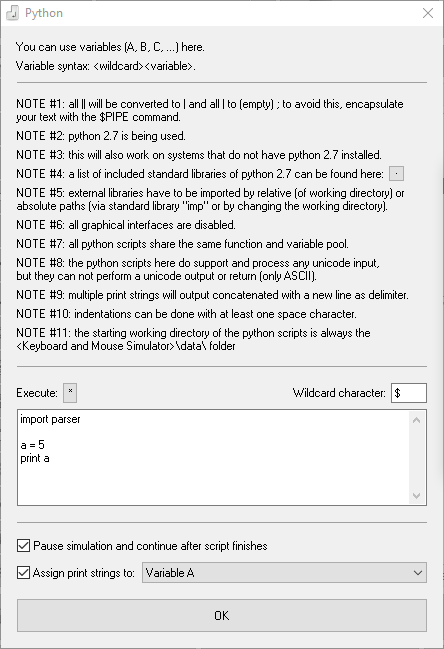 Some of the program's functions will not work without admin rights. It's highly recommended to run this program as administrator.